Insulspan provided the structural insulated panels for use in the construction of one of the most sustainable Ontario homes of this year. The Archetype Sustainable house is located at The Living City Campus at Kortright in Ontario. 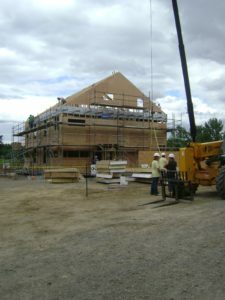 The home demonstrates sustainable technologies, materials, and practices for the production build residential market. The Sustainable Housing Competition winner’s design was by Building Blocks. The team included Stone’s Throw Design Inc., Fort Architect Inc., and Lori Architects. The team’s modular design presented Insulspan SIPs with a tremendous opportunity to serve as the ideal construction and insulating solution. This is because our SIPs are more than an energy-saving product. They drive construction efficiency due to our factory designing and pre-cutting. Then, they ship to your job site ready-to-assemble. SIPs are also easy to install and reduce your site time on projects. 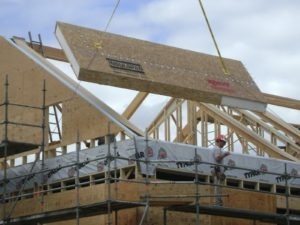 Insulspan SIPs are a perfect blend of energy efficient building methods and materials. This Ontario home was a pursuit of excellence that did not stop with SIPs. Once complete, the house seeks to earn multiple certifications such as LEED® for Homes, Energy Star, and R2000. The technologies within the Archetype Sustainable house make such certifications possible. Aside from the use of the Insulspan structural insulated panel system, the home also uses energy efficient technologies in the heating and cooling system, the windows, insulating products, and solar power aspects of the home. Once complete, the home will have multiple certifications such as LEED® for Homes, Energy Star, and R2000. The project began in 2005 with a national design competition sponsored by the Toronto Region Conservation Authority (which operates Kortright). The design competition was run by the Design Exchange. Exact criteria called for a four bedroom home with garage, designed for mass production, with an innovative wastewater treatment. It must meet LEED® Gold (Leadership in Energy and Environmental Design) certification standards and Energy Star standards. The winning Ontario home incorporates Better Building Ideas from PFB by using Insulspan SIPs as well as other EPS (Expanded Polystyrene) insulation products from Plasti-Fab Ltd.
See the completed Archetype Sustainable house here.